Vietnam Restaurant has been passionately serving South Australia with authentic Vietnamese Cuisine since 1984. From humble beginnings, husband and wife team Dinh and Suong were among the first boat people to arrive onto Australian soil from a war torn Vietnam. With nothing but the clothes on their back, they had to endure many years of hardship before perseverance and hard work could culminate in the birth of the Vietnam Restaurant. 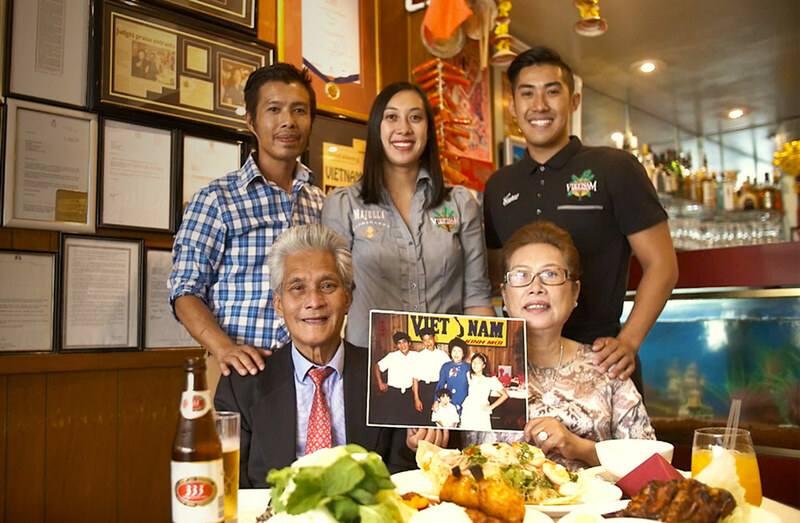 Together with their children Tien, Linda and Ben, the Phan Family run one of the longest and most awarded Vietnamese restaurant in Australia. Thank you for your interest in our family restaurant and we look forward to making your journey to Adelaide’s Original and Favourite Vietnamese restaurant a memorable and enjoyable one. Combination of Spanish onion, glass vermicelli, mint, coriander and freshly steamed king prawns, scallops and quid tossed with a traditional zesty vinaigrette. Not a fan of seafood, why not try our chicken or rare beef option? Truly a crowd favourite at Vietnam!